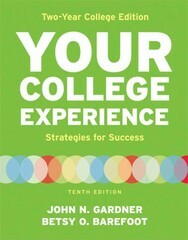 Your College Experience, Two Year College Edition 10 Edition Written by the leading authorities on the first-year seminar and grounded in research, Your College Experience, Two-Year College Edition by John Gardner and Betsy Barefoot offers today's diverse students the practical help they need to make the transition to college and get the most out of their time there. Goal setting has always been central to this text, and the Tenth Edition has been revised with added coverage and activities to strengthen this material throughout. In addition, a new focus on self-assessment of strengths will help students see where they are already succeeding so that they get off to a great start and stay in college. This version of the text maintains the authoritative, research-driven approach of the Tenth Edition and has been edited carefully to address the specific needs of 2-year students. A full package of instructional support materials — including an Instructor's Annotated Edition, Instructor's Manual, PowerPoint slides, videos, and a Test Bank — provides new and experienced instructors all the tools they will need to engage students in this course and increase student retention.